About 30 years ago before the death of Communist dictator Enver Hoxha Albania was an officially atheist State, where even mentioning religion could land a person in the dungeons. 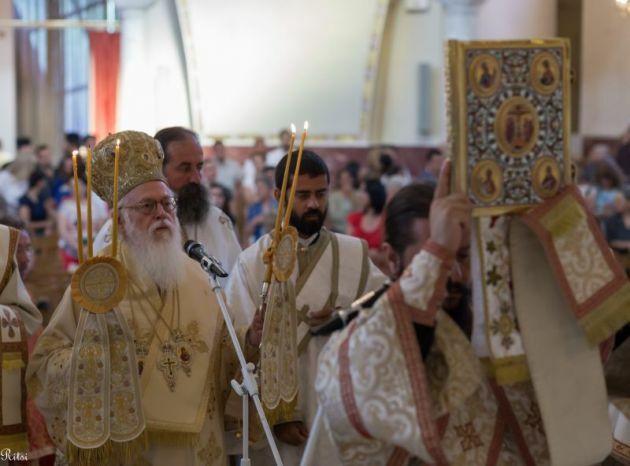 This month the Orthodox Church of Albania, with a Festive Divine Liturgy on Aug. 2, celebrated the 25th anniversary of the election and appointment of Archbishop Anastasios as the head of the church. Many regard the canonical revival of the Orthodox Church of Albania as beginning when the Ecumenical Patriarchate of Constantinople sent Archbishop Anastasios - at that time the Metropolitan of Androussa, moderator of the Commission on World Mission and Evangelism of the World Council of Churches. He was also the acting archbishop of the Archdiocese of Kenya, Uganda and Tanzania. In May this year, the United Nations Special Rapporteur on freedom of religion or belief, Ahmed Shaheed, praised the Albanian Government's policies and practices to promote and protect interreligious harmony and co-existence in the country. However, he noted that Albania's multi-religious society faces many challenges, including democratic consolidation, economic and social development, as well as those related to rapid globalization. He urged the authorities to address unresolved issues dating back to 1967, when Albania officially became an atheist State. "Freedom of religion or belief is a practical reality in Albania, and there is much the world can learn from the Albanian experience in respecting freedom of thought, conscience and religion or belief and achieving inter-religious harmony," Shaheed said. He was speaking at the end of his first fact-finding mission to the country, from May 8 to 17. The expert noted that Albania is a multi-religious society with a deeply troubled past where intense and systematic persecution of all religions, after the late sixties. Under the iron-fisted communist rule of Enver Hoxha from 1944 until his death in 198, Albania effectively wiped out religious institutions in the country and had banned all public expressions of religion by the eighties. "Many issues related to the abuses carried out prior to the end of the authoritarian rule in 1990 remain unresolved, such as the restitution of properties seized and destroyed or repurposed by the state," Shaheed stressed. "However, the free, voluntary and respectful expression of religious sentiment lies at the heart of the interreligious harmony and co-existence that characterizes the situation of freedom of religion or belief in Albania today," he said. "The underlying circumstances and disposition that nourish and promote interfaith harmony in Albania are unique to the country, and there are many examples of good practices, in both governmental policy and communal engagement that can be instructive to the international community," Shaheed said. In a news statemen earlier in August, the Orthodox Church of Albania expressed joy and gratitude for Archbishop Anastasios. "Even in the most difficult moments, with abundant blessings from God and the continuous support of the Orthodox faithful of Albania, he accomplished a real miracle," read the statement. In his message at the Festive Divine Liturgy, Archbishop Anastasios recalled the path followed by him since the beginning of his work till the present. He noted, in particular, that these achievements are simply the starting point of an ongoing journey of resurrection for the Orthodox Church of Albania.